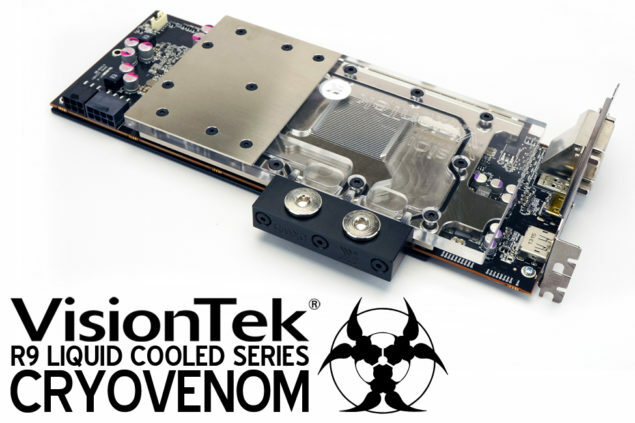 VisionTek, a leading manufacturer of hardware components has announced their latest CryoVenom Radeon R9 290 graphics card featuring their custom-built liquid cooler which delivers superior cooling performance to AMD Hawaii GPU. Press Release – VisionTek Products LLC, (VisionTek®) http://www.visiontekproducts.com, a leading manufacturer of award-winning, high-performance upgrades and accessories for PC and Apple Macintosh® computers, announced today its CryoVenom Radeon R9 290 as the industry’s first and fastest custom-built liquid cooled AMD Radeon™ R9 290 graphics card on the market and available for immediate shipping. The hand-built card delivers lower temperature, near silent operation, and higher performance compared to VisionTek’s stock R9 290 card; as well as better benchmark performance and a $150 lower price than the NVIDIA®GeForce® GTX™ 780 Ti. Because VisionTek feels the “coolest” computer hardware product introduction at the 2014 Consumer Electronics Show deserves the “coolest” launch event, the $550 MSRP card will be demonstrated during a media invite only event January 8 at the Minus5 Ice Bar. The Radeon R9 290 series of graphics cards are rated by many sources as the best graphics cards available today. However, VisionTek engineers discovered that when its R9 290 graphics card was 100% utilized in the testing lab under conditions such as extended game play – the card’s temperature could climb to 201°F. Even with very efficient fan cooling and the latest AMD Catalyst driver that provides a 100% fan speed operation, the card’s built-in thermal safety feature would downclock the GPU from the factory 947MHz speed to as low as 662MHz. Combined with this performance reduction of 30%, the increase in fan noise was measured at 71dB, a sound level considered louder than a normal conversation. To make sure multimedia professionals and gaming enthusiasts would experience maximum performance potential, VisionTek created the CryoVenom R9 290 graphics card. By utilizing a custom designed water block and backplate solution, the CryoVenom R9 290 can run up to 38% cooler (125°F) while being overclocked up to 24% (1.1GHz) all while registering under 10dB1 of noise, which is the sound level of a pin drop. To assure stable overclocked performance, the FurMark GPU stress utility is employed to put a 100% load on each CryoVenom R9 290’s GPU for an extended time period to determine the optimum overclock setting with a 5% safe “headroom”. Those unique, certified overclock specifications are entered onto a build sheet that is personally signed by the VisionTek’s “Custom Shop” team member that built and tested the CryoVenom card. Each card is then extensively pressure tested to ensure leak-free cooling reliability. Obtaining maximum performance from the CryoVenom Radeon R9 290 couldn’t be easier. Just enter the specifications from the included build sheet in the Catalyst™ Control Center and in less than a minute, the CryoVenom R9 290 can safely deliver up to 1175MHz GPU speed…a 24% increase from the stock setting of 947MHz. The memory clock speed is also increased up to 1450MHz… 16% faster than the 1250MHz stock setting. And unlike standard cards in which overclocking voids the warranty, the CryoVenom R9 290 comes backed by a one year warranty. Not content to just increase its stock R9 290 card performance, VisionTek’s goal was to create the industry’s fastest single GPU graphics card at a lower price than the competition’s fastest comparable card2. In the 3DMark Fire Strike Extreme setting testing, the $550 MSRP CryoVenom R9 290 scored 9330 while the $700 street price NVIDIA GeForce GTX 780 Ti recorded an 8816 score. The CryoVenom R9 290’s water block provides maximum cooling performance for the GPU, RAM, and Voltage Regulation Module (VRM) even when low power water pumps are utilized. The block’s electrolytic copper base is clad with a chrome appearance-like nickel plating to prevent corrosion while the precision cut acrylic top provides effective and quiet fluid flow. The CNC machined black anodized aluminum backplate protects the card’s sensitive circuit board components during installation handling while also providing additional passive cooling for the VRM.